Adjacent to two-Michelin-star Atera, Farm.One distributes lesser-known microgreens and herbs to chefs throughout the boroughs. Éclairs adorned with tiny lemon gem Marigolds, crab claws topped with tender mustard frills, a sprig of nepitella on Robiola cheesecake. The rare microgreens and vibrant blossoms that embellish these dishes all share the same unlikely origin: the basement of a loft building in TriBeCa where they are custom-grown for chefs in a hydroponic Garden of Eden called Farm.One, and hand delivered by bicycle or subway to restaurants around the city. For today’s top toques, garnishes mean more than just a last minute sprig of mint or parsley. 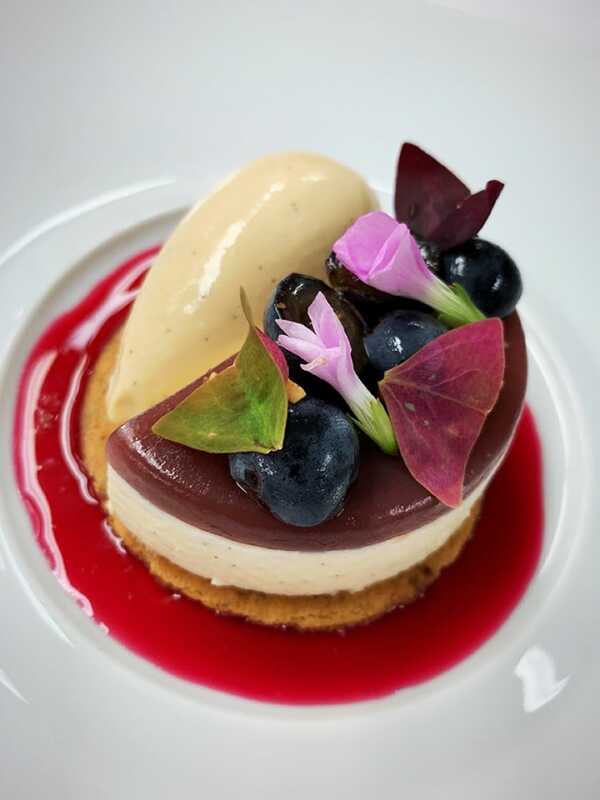 Herb and edible flower accents are part of the overall concept of a dish, designed to enhance a sensory profile of color, flavor and texture. And to chefs like Chetan Shetty of Indian Accent, Farm.One “is like having a personal mini farm,” where he can select from hundreds of varieties of micro plants—anise hyssop to za’atar marjoram—to complement his cuisine. 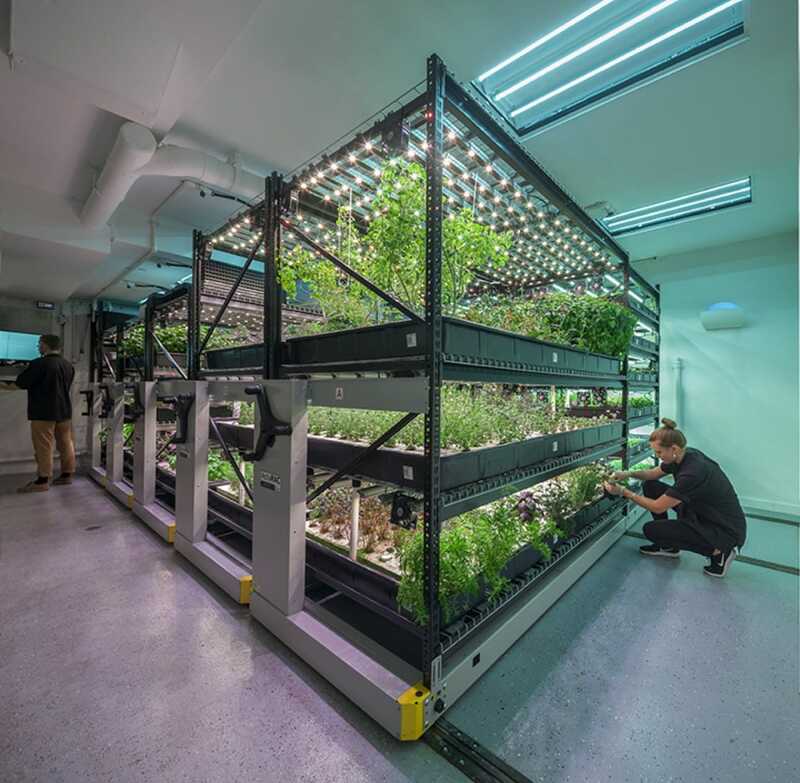 When one of his clients, two-Michelin-starred Atera on Worth Street, suggested he take over a large unused storage room in their basement, Laing and his team transformed the space into a 1,500-square-foot botanical wonderland, filled floor to ceiling with rows of rolling shelves that house trays of mini plants growing under sun-simulating LED lights. Seedlings are started in spongy peat moss cups that resemble brownies, their roots immersed in recycled water. The temperature is constant; the airflow and humidity, controlled and monitored. “It’s a perfect summer day year round,” Laing declares, “there are no weather problems.” Also, insecticides are unnecessary because there are no raccoon raiders, no pests—just some benevolent ladybugs brought in to control any mites or aphids. However, “We are as much a technology [company] as an agricultural company,” says the firm’s plant scientist Caleb Raff, who oversees all aspects of plant growth. There are sensors and cameras to help record yields, databases to keep track of some 600 varieties of seeds and for figuring out when each plant will be ready for harvest—from two to three weeks for leaves, longer for flowers. The system is so precise that a client can specify the exact size of a leaf or the length of a stem. For Atera, where Danish chef Ronny Emborg is noted for his elegant, sensory-style cuisine, having a farm at home base stimulates creativity. “It is such a luxury to literally walk across the hall and get some freshly trimmed herbs,” says his head chef James Moore. That perk is in addition to a special section reserved for plants the restaurant pre-orders for upcoming menus. Emborg’s constantly evolving 16- to 17-course tasting menu includes dishes like halibut with cauliflower and brown butter that is plated tableside with young pea tendrils and wood sorrel blossoms providing the final touch. “The wood sorrel is high in oxalic acid which gives it a nice acidity in the bite,” observes Atera’s general manager Matthew Abbick. 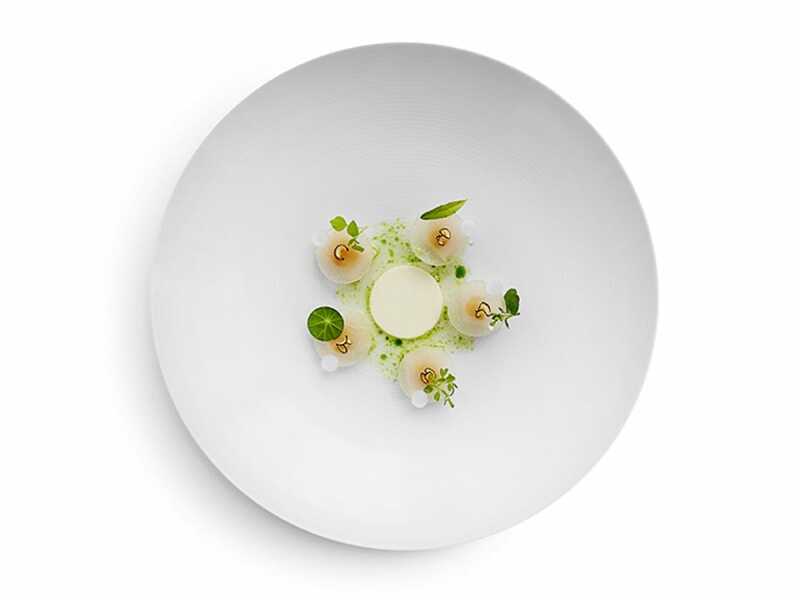 One course that is a showcase for microgreens consists of a scallop, cut into five slices, each topped with almond butter and apple and a different herb: nasturtium, watercress, lemon verbena, chickweed and pea tendril. “It’s fun to see how each green complements the other ingredients differently,” notes Abbick. Uptown chefs don’t have the luxury of proximity to the farm, but chef Shetty hops a subway to Worth Street while composing a menu, working with the farm team to understand the length of time needed for his plants to mature and exploring new options. Among his favorites: nasturtium that gives a slight kick of pepperiness to a rich dish of pork dumplings with pumpkin sauce from Northeastern India and mustard frills that provide a fresh crispy crunch and beautiful green hue to crab claws without overpowering the sweet seafood. The perfect flower right now for Deborah Racicot, pastry chef at Locanda Verde, is an orange violet, “because it’s winter and you’re going to have more gold tones.” She started talking about them with Gibbons this summer so they would be ready in time to add a flourish to a cinnamon tarta with poached persimmons and mascarpone cream. Also on Racicot’s menu is a stone fruit Robiola cheesecake with a basil crust and honey balsamic agridolce, topped with the Italian herb nepitella, a member of the mint family with oregano-like leaves and a woodsy flavor. Joven has high praise for Farm.One products and procedures: “I appreciate their willingness to satisfy our needs, specific count, color, length, etc. They nerd out on herbs and flowers,”	enabling New York diners to admire and savor the perfect garnish. Editor’s Note: While Farm.One does not sell to consumers, they offer tasting tours that can be booked on their website. about global cuisines. She covers the delicious world of sweets, and often eats dessert first.